This was to be my second trip volunteering in Haiti. The first was an eye opening experience, both horrifying and inspiring. The people of Haiti have been dealt a hand that is for most impossible to comprehend; yet they continue to smile and laugh and want nothing more than to work and be part of their solution. My time there was a short two weeks, but the day I left I knew I would be back. During my first trip I met Adam Marlatt, an active Marine and the founder of Global DIRT. His brand of “extreme humanitarianism” impressed me, so on my second trip I emailed him to see if I could work with his organization. Essentially, Global DIRT operates as a mobile unit. Other organizations & NGO’s call them in to do whatever needs to be done, including jobs that others are either incapable or unwilling to do. I specifically planned this trip to be in Haiti during the presidential elections, and knew that Adam and his group of Marines would make certain to be wherever help was most needed. Upon arrival in Haiti, Adam and Leah Bomberger (the team translator, missionary, and all around den sister- she’s too young to call a den mother) met me at the airport and brought me back to DIRT headquarters- affectionately referred to as the bat cave. My first night in Haiti was all about being “brought up to speed”. Nights two and three were all about being “thrown into the fire”, as DIRT volunteers worked the 7pm to 7am shift at a local cholera clinic. Cholera is a horrific disease that attacks the small intestines. Symptoms are profuse diarrhea and vomiting. If treated quickly and properly, recovery rates are high. If treatment is delayed, cholera can take a life within 24 hours. Primary treatment for cholera is rehydration, which means hooking up patients to an IV, and keeping them as comfortable as possible while they take in the fluids they are continually expelling. This grueling process gives their bodies a chance to fight the disease. The number of patients at our clinic varied between 50 and 100 at any one time, a number of them small children or infants. Media reports estimate 100,000 people have been infected and 2,500 have died. The grim reality is that these numbers are significantly higher. Several days into my stay in Haiti we were contacted by an organization called Grassroots United. They had received word of a village that was hit hard with cholera and because it was located up a mountainside 4-hours from the nearest paved road, there was no local clinic or resources for treatment. We were asked to hike in, assess the situation, and report back on the needs of the village. The following day we grabbed all the supplies we could and drove a few hours across Haiti where we stayed with the missionaries who had first heard about the remote village; the name of which we learned was Pays Pourri. A priest from a local church asked us to spend our first day visiting a different village where a woman had died from cholera. The villagers were afraid to touch the body and asked us to take care of her- a task, the details of which I will graciously omit from this blog entry. The population of the small village is about 2,000 and they have only one water supply from a creek that was infested with cholera. As we watched young boys filling water jugs from the creek we knew the sad reality was that there was simply nothing we could do about it. That night we reported our findings and spent a second night sleeping, (or not…mostly not) on the concrete roof of the home the missionaries were renting. The next morning we woke early hoping to begin our hike to Pays Pourri before the Haitian sun was at full blast. The hike itself was quite beautiful. After 4 tough hours, mostly in the heat we were hoping to avoid, we arrived at Pays Pourri. We first met with some villagers who showed us the cistern in which they keep their water supply. We then visited a local school where several dozen children ran to the fence to greet us. Taking pictures of kids and showing them their digital image is always good fun. Children here don’t often, if ever, see technology like digital cameras. We enjoyed watching their faces light up when seeing their image for the first time. Information in Haiti is often inaccurate and this time we were very thankful to learn the rumors of the epidemic we heard so much about were inaccurate. The people of Pays Pourri were by in large both happy and healthy. Thankfully they also understood the need to keep their water supply clean. That said, chances of the cholera epidemic making its way up the mountain and infecting this beautiful village is more than likely. After returning to Port au Prince we met with the good people at Water Missions International. I had contacted them about securing one of their industrial water filtration systems. The systems cost upward of $25,000 per unit but are capable of filtering enough water to supply 5,000 people per day. One of these systems could save the entire small village we visited on the first day in the mountains. Water Missions not only makes the filters, but helps secure funding so they can be distributed where they are needed most, and not just to those who can afford them. To date Water Missions has placed over 140 of these systems throughout Haiti, saving untold numerous lives. My last few days in Haiti were both interesting and monotonous. The presidential election took place and, as predicted, it was far from being an honest and fair process. Inevitably, people took to the streets and Haiti was overcome with rioting and chaos. During the riots, our driver refused to leave home to pick us up leaving us stranded with few options to make ourselves useful. Thankfully Haiti brews very good rum…enough said. The next few days we took a few long walks to see what was happening around the city. It was relatively quiet near us compared to what was going on elsewhere. We did see our fair share of burning tires and other items that had been lit on fire in protest. There were also plenty of overturned, burned-out cars, and hundreds of UN peacekeepers in full riot gear doing a mix of what they could, and what they had to. On top of an earthquake that killed over 200,000 and left greater than 1 million homeless, and a cholera epidemic that is running rampant and has the potential to kill even more than the earthquake, Haiti is now facing political turmoil from a corrupt government willing to do anything to remain in power. An earthquake, an epidemic, and now very possibly, a revolution. HAITI NEEDS OUR HELP. Haiti needs YOUR help. 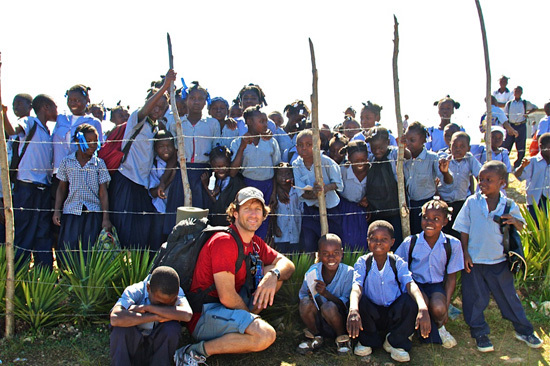 If you have the time or interest, volunteering in Haiti is an incredibly rewarding experience. If not, make a donation, and please consider donating to Global DIRT- amazing people doing so very much with so very little. To do so just click the Donate button. For more pictures, visit Michael’s Flickr photostream. Global Disaster Immediate Response Team (DIRT) members have been continuing relief efforts on the ground in Haiti since the January 12 earthquake and have most recently responded to both Hurricane Tomas and the cholera outbreak. The DIRT team was the first to arrive in Saint-Marc to provide assistance to St. Nicholas Hospital in response to the cholera outbreak in the region. As the epidemic spread, Global DIRT acquired an ambulance from Youth With a Mission (YMAM). Global DIRT and YMAM together ran the only on-call ambulance in Saint-Marc where the teams transported cholera victims that were unable to travel for to the hospital for treatment. Global DIRT’s additional personnel then landed in Haiti and resupplied the MSF (Medecins Sans Frontieres, or Doctors Without Borders) facility with HTIwater hydrowells and hydropacks that produce an ORS (oral rehydration salts) solution from non-potable water. As news developed about tropical storm Tomas, the Global DIRT team returned to Port-au-Prince to prepare for an EMS response. The team prepped a mass casualty ambulance, a swift water rescue rig, a traditional ambulance rig, and coordinated with Haiti’s University and Educational Hospital (HUEH) to have two additional ambulances on standby. The team spread the EMS contact number for direct assistance in case of emergency. The morning that the hurricane hit, a Global DIRT unit evaluated tent cities and flooding in Carrefour, Cite Soleil, Petionville, and the greater Port-au-Prince area to provide feedback to other NGO’s and Haiti’s Joint Operations and Tasking Center (JOTC). As the day continued, EMS rigs were sent to tent cities to provide health and wellness checks in between bouts of hurricane-force rain. The Global DIRT team continues to deploy EMS assets to Port-au-Prince and will be receiving additional personnel in the coming days. For those looking for a way to help Haiti, please consider giving to Global DIRT to help us continue our EMS and logistical coordination efforts in the greater Port-au-Prince area. Your contributions go directly to the purchase of safe medical supplies, gas for ambulances and the salaries of Global DIRT’s Haitian employees. For more information about Global DIRT’s efforts in Haiti, please check out the “Current Project” page on our website, or contact our volunteer team directly through the Global DIRT contact form. Again, as always, thank you sincerely for your continued support of Global DIRT and for raising awareness about the conditions in Haiti. Tonight, from 5pm until close, the Portsmouth, NH Flatbread Company will be hosting a benefit night for Global DIRT. We will have team members there to talk to people joining us for the event as well as a photo slide-show of some of our work. A portion of the night’s profits will be donated to our organization. So come down and eat as much pizza as you can to help raise some money for our group! We will be using all of the money raised to continue focusing all of our efforts on the ground in Haiti. Our next big project is starting an ambulance service which will take both a lot of work and a great deal of funds so we hope that tonight is a big success! If you can’t join us but still want to support, please donate online through this website.